It is March 1972, and the Nixon White House wants Jack Anderson dead. The syndicated columnist Jack Anderson, the most famous and feared investigative reporter in the nation, has exposed yet another of the President's dirty secrets. Nixon's operatives are ordered to "stop Anderson at all costs" - permanently. Across the street from the White House, they huddle in a hotel basement to conspire. Should they try "Aspirin Roulette" and break into Anderson's home to plant a poisoned pill in one of his medicine bottles? Could they smear LSD on the journalist's steering wheel, so that he would absorb it through his skin, lose control of his car, and crash? Or stage a routine-looking mugging, making Anderson appear to be one more fatal victim of Washington's notorious street crime? 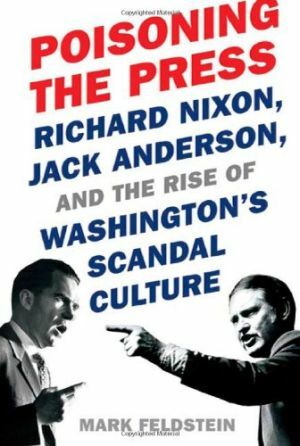 Poisoning the Press: Richard Nixon, Jack Anderson, and the Rise of Washington's Scandal Culture recounts not only the disturbing story of an unprecedented White House conspiracy to assassinate a journalist, but also the larger tale of the bitter quarter-century battle between the postwar era's most embattled politician and its most reviled newsman. The struggle between Nixon and Anderson included bribery, blackmail, forgery, spying, and burglary as well as the White House murder plot. Their vendetta symbolized and accelerated the growing conflict between the government and the press, a clash that would long outlive both men. Mark Feldstein traces the arc of this confrontation between a vindictive president and a flamboyant, crusading muckraker who rifled through garbage and swiped classified papers in pursuit of his prey - stoking the paranoia in Nixon that would ultimately lead to his ruin. The White House plot to poison Anderson, Feldstein argues, is a metaphor for the poisoned political atmosphere that would follow, and the toxic sensationalism that contaminates contemporary media discourse. Melding history and biography, Poisoning the Press unearths significant new information from more than two hundred interviews and thousands of declassified documents and tapes. This is a chronicle of political intrigue and the true price of power for politicians and journalists alike. The result - Washington's modern scandal culture - was Richard Nixon's ultimate revenge.